A second horse has died in chuckwagon racing at the Calgary Stampede, raising the ire of animal advocacy groups. Stampede officials said driver error was to blame for the loss of a horse during racing on Monday. The incident occurred during the second heat when Shane Nolin’s wagon made contact with the lead horse of BJ Carey’s team on the third corner of the racetrack. The collision resulted in a severe injury to one of Carey’s horses. The horse was euthanized the followed day. The Chuckwagon Safety Commission determined that both drivers were responsible for creating the circumstances that led to the incident. Under the Stampede’s chuckwagon racing rulebook, a $C10,000 fine is assessed against a driver whose actions cause the death of a horse, payable to the owner of that horse. Nolin was fined $C5000 and Carey was assessed a $5000 deduction from the compensation he was to receive for his lost horse. In effect, both drivers have equally shared the financial burden of the $C10,000 fine, Stampede officials said. The 10-second time penalty levied yesterday against Nolin would stand. It is the first time the safety commission has found dual culpability in relation to driver error in a hearing since its inception in 2008. “Although driver error is rare, we know that the Stampede, the two professional associations and the drivers themselves are working together to ensure these incidents are not repeated,” said Stan Church, chairman of the safety commission. The first death occurred on Saturday evening, during the sixth heat of chuckwagon races. A 10-year-old thoroughbred named Duke, competing in the team of Layne Bremner, suffered a broken cannon bone in his right hind leg. He was euthanized. The injury appeared to have been sustained in contact with another wagon. Bremner, who was driving, received a “no-time” sanction, a $C2500 penalty, and a five-second penalty for interference. Stampede officials described the two deaths, both of which resulted from driver error, as extremely regrettable. They said they were working with the drivers’ professional bodies to ensure the primary focus of drivers was running a safe, clean race. The loss of the two horses in three days of chuckwagon racing was condemned by the Vancouver Humane Society, which repeated its call for the immediate suspension of chuckwagon racing at the Stampede. “People across Canada are outraged and they are sick of hearing about the needless death of horses at the Stampede,” spokesman Peter Fricker said. The society says the Stampede should suspend chuckwagon racing and establish a panel of independent equine experts to determine if anything can be done to make it safer. Meanwhile, the Canadian charity Animal Justice called on the Calgary Humane Society, which is responsible for enforcing Alberta’s animal protection laws, to prosecute over what it called inhumane rodeo practices at the Stampede. 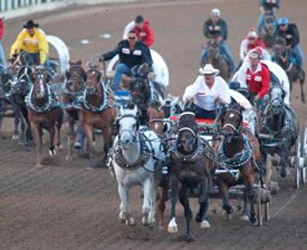 It noted that more than 50 horses had been killed during chuckwagon racing at the event since 1986. The group also condemned calf roping. It noted that no Canadian rodeo or participant been been prosecuted since 1950. Organizers of the Calgary Stampede have increased efforts in recent years to improve safety in chuckwagon racing, in response to public concern over the death and casualty rates. They brought in changes in 2011 aimed at making chuckwagon races safer for horses and competitors. All horses are now inspected by veterinarians on arrival at the Stampede, and before and after races. Horses are now given mandatory rest days during the competition. Officials also reduced the number of outriders in each chuckwagon. Chuckwagons were driven to the range, loaded with food and supplies for the cowboys. They were not “raced”. They are heavy, unwieldy wagons, not racing sulkies. What is wrong with you people? My husband worked on the big ranches, dined at the chuckwagon. He never mentioned a race. This is not “western heritage”, it is an idiot’s mission.